Clawing is normal behavior. Young kittens use their claws to climb. At 4-5 months of age, they become skilled jumpers and transition to clawing to mark territory and keep their nails sharp. The healthy nail: unlike our finger nails and dog claws, cat claws grow a triangular base and a narrow curved tip, then stop growing. Every few months, the hard outer “husk” sheds and a fresh nail is revealed underneath. Many cats use horizontal surfaces such as rugs and cardboard scratchers to sharpen their nails and remove husks. 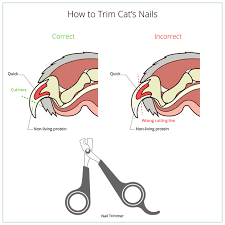 The nails on indoor cats can be trimmed every 4-6 weeks to remove the sharp tips. Free nail trims are included in all of our wellness plans. If introduced slowly and gently, many cats allow their nails to be trimmed at home. Cats have an instinct to mark the edges of their territories by making horizontal parallel grooves in tree trunks and laying down pheromones from their paw pads. House cats may substitute the corners of sofas, table legs, and door jams. We would prefer they use scratching posts. A good scratching post is vertical, is at least 3 feet tall, and located so it sticks out into the floor space. Prime locations include next to the sofa, at the end of the kitchen island, and in a bend in the hall. Cats love carpet and sisal rope, but some really like a nice piece of firewood or cardboard. Feliscratch is an excellent tool to train cats young and old to a scratching post. It incorporates visual and pheromone cues as well as a catnip attractant. For people with fragile skin or fragile furnishings, the Soft Paws are an excellent option. After trimming the nail, these silicone caps are glued on for a smooth, dull buffer. We offer application as a service or you can take the kit home for DIY. Soft Paws come in many fun colors.